Existence has been variously defined by sources. In common usage, it is the world one is aware or conscious of through one's senses, and that persists independent of one's absence. Other definitions describe it as everything that 'is', or more simply, everything. Some define it to be everything that most people believe in. Aristotle relates the concept to causality. 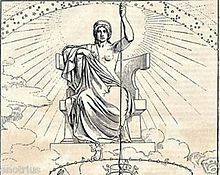 The Statue of Liberty - The goal of world community with peace, liberty, and justice for all; respect for the interdependent web of all existence of which we are a part . The goal of world community with peace, liberty, and justice for all; respect for the interdependent web of all existence of which we are a part. Luca Giordano - Dream of Solomon - Karl W. Benzing:[So], non-existence of nothingness proves Basic Existence! Since God must be basic Existence, the mere presence of basic Existence proves the existence of God. [So], non-existence of nothingness proves Basic Existence! Since God must be basic Existence, the mere presence of basic Existence proves the existence of God. Wilamowitz, K.Borinski:Ananke remained an elusive outsider, often perceived as cruel. But it is important that at an early stage religious and philosophical speculation closely linked Ananke to the elements of the world's existence (among which Goethe included her too). Of our bedfellow Death, and cry: "O fudge!" Ananke remained an elusive outsider, often perceived as cruel. But it is important that at an early stage religious and philosophical speculation closely linked Ananke to the elements of the world's existence (among which Goethe included her too). Itself—and equal to all woes. And where we had thought to find an abomination, we shall find a god; where we had thought to slay another, we shall slay ourselves; Where we had thought to travel outward, we will come to the center of our own existence; where we had thought to be alone, we shall be with all the world. To have his path made clear for him is the aspiration of every human being in our beclouded and tempestuous existence. For thousands of years, human beings have contemplated the world about them and asked the great questions of existence... Today... many of these great questions are part of science, and some scientists claim they may be on the verge of providing answers. Perhaps existence isn't something that gets bestowed from the outside, by having "fire breathed" into a potentiality by some unexplained fire-breathing agency (that is, a transcendent existence generator) but is ...something self-activating. I have suggested that only self-consistent loops capable of understanding themselves can create themselves, so that only universes with (at least the potential for) life and mind really exist. The chances of each of us coming into existence are infinitesimally small, and even though we shall all die some day, we should count ourselves fantastically lucky to get our decades in the sun. It is completely unrealistic to claim, as Gould and many others do, that religion keeps itself away from science's turf, restricting itself to morals and values. A universe with a supernatural presence would be a fundamentally and qualitatively different kind of universe from one without. The difference is, inescapably, a scientific difference. Religions make existence claims, and this means scientific claims. Richard Dawkins (1998). When Religion Steps on Science's Turf. Free Inquiry. Retrieved on 2008-09-13. Ninety-nine people out of a hundred have not seriously considered what they mean by the term "exist" nor how a thing qualifies itself to be labelled real. Ours is the commencement of a flying age, and I am happy to have popped into existence at a period so interesting. Indeed, in the social jungle of human existence, there is no feeling of being alive without a sense of identity. The very existence of government at all, infers inequality. Concealment does not veil Him. His pre-existence procceeded time, His being preceded not-being, His eternity preceded limit. One great part of every human existence is passed in a state which cannot be rendered sensible by the use of wide awake language. 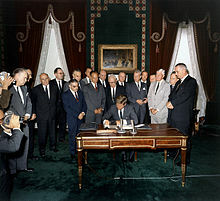 John F. Kennedy:When power leads man toward arrogance, poetry reminds him of his limitations. When power narrows the area of man's concern, poetry reminds him of the richness and diversity of existence. When power corrupts, poetry cleanses. Irony is the birth-pangs of the objective mind (based upon the misrelationship, discovered by the I, between existence [Existentsen] and the idea of existence. They envy you for not envying them. One of the greatest sorrows of human existence is that some people aren't happy merely to be alive but find their happiness only in the misery of others. Millions of people toil in the shadow of the law we make, and much of their livelihood is made possible by the existence of intellectual property rights. The most terrifying fact about the universe is not that it is hostile but that it is indifferent; but if we can come to terms with this indifference and accept the challenges of life within the boundaries of death — however mutable man may be able to make them — our existence as a species can have genuine meaning and fulfillment. However, vast darkness, we must supply our own light. The ultimate goal of the Web is to support and improve our web-like existence in the world. We clump into family, association, and companies. To exist means to be something, a thing, a feeling, a thought, an idea. All existence is particular. Only being is universal, in the sense that every being is compatible with every other being. Existences clash, being – never. Existence means becoming, change, birth and death, and birth again, while in being there is silent peace. Every moment of one's existence one is growing into more or retreating into less. One is always living a little more or dying a little bit. The universe is one great kindergarden for man. Everything that exists has brought with it its own peculiar lesson. The mountain teaches stability and grandeur; the ocean immensity and change. Forests, lakes, and rivers, clouds and winds, stars and flowers, stupendous glaciers and crystal snowflakes - every form of animate or inanimate existence, leaves its impress upon the soul of man. Even the bee and ant have brought their little lessons of industry and economy. The Savior said, All nature, all formations, all creatures exist in and with one another. We are responsible to ourselves for our own existence; consequently we want to be the true helmsman of this existence and refuse to allow our existence to resemble a mindless act of chance. P. D. Ouspensky:Man is confronted with two obvious facts: The existence of the world in which he lives; and the existence of psychic life in himself. Man is confronted with two obvious facts: The existence of the world in which he lives; and the existence of psychic life in himself. Robert Peel:Police, at all times, should maintain a relationship with the public that gives reality to the historic tradition that the police are the public and the public are the police; the police being only members of the public who are paid to give full-time attention to duties which are incumbent on every citizen in the interests of community welfare and existence. If you knew that your life was merely a phase or short, short segment of your entire existence, how would you live? Knowing nothing 'real' was at risk, what would you do? You'd live a gigantic, bold, fun, dazzling life. You know you would. That's what the ghosts want us to do - all the exciting things they no longer can. Ronald Reagan:Welfare's purpose should be to eliminate, as far as possible, the need for its own existence. Existence is a mystery, and one should accept it as a mystery and not pretend to have any explanation. Civilization is the progress toward a society of privacy. The savage's whole existence is public, ruled by the laws of his tribe. Civilization is the process of setting man free from men. It appeared to me that the dignity of which human existence is capable is not attainable by devotion to the mechanism of life, and that unless contemplation of eternal things is preserved, mankind will become no better than well-fed pigs. 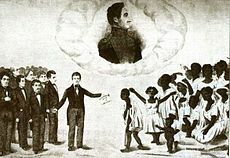 José Gregorio Monagas abolished slavery in Venezuela in 1854. Real intelligence must be fiercely capable of investigating every aspect of existence, including the very process of knowledge that we call science. All the manifested world of things and beings are projected by imagination upon the substratum which is the Eternal All pervading Vishnu, whose nature is Existence-Intelligence; just as the different ornaments are all made out of the same gold. Recognition of the modes of existence of technical objects must be the result of philosophic consideration; what philosophy has to achieve in this respect is analogous to what the abolition of slavery achieved in affirming the worth of the individual human being. To furnish the means of acquiring knowledge is…the greatest benefit that can be conferred upon mankind. It prolongs life itself and enlarges the sphere of existence. Statistically, the probability of any one of us being here is so small that you'd think the mere fact of existing would keep us all in a contented dazzlement of surprise. We are alive against the stupendous odds of genetics, infinitely outnumbered by all the alternatives who might, except for luck, be in our places. Man’s basic anxiety … drives the anxious subject to establish objects of fear. Anxiety strives to become fear, because fear can be met by courage. … Horror is ordinarily avoided by the transformation of anxiety into fear of something, no matter what. The human mind is not only, as Calvin has said, a permanent factory of idols, it is also a permanent factory of fears—the first in order to escape God, the second in order to escape anxiety. … But ultimately the attempts to transform anxiety into fear are vain. The basic anxiety, the anxiety of a finite being about the threat of nonbeing, cannot be eliminated. It belongs to existence itself. Paul Tillich, The Courage To Be (1952), p. 39. Life is a wave which in no two consecutive moments of its existence is composed of the same particles. One important reason for studying philosophy is that it deals with fundamental questions about the meaning of our existence. I experience the same sense of absurdity when I listen to a cosmologist like Stephen Hawking telling us that the universe began with a big bang fifteen billion years ago, and that physics will shortly create a 'theory of everything' that will answer every possible question about our universe; this entails the corollary that God is an unnecessary hypothesis. Then I think of the day when I suddenly realized that I did not know where space ended, and it becomes obvious that Hawking is also burying his head in the sand. God may be an unnecessary hypothesis for all I know, and I do not have the least objection to Hawking dispensing with him, but until we can understand why there is existence rather than nonexistence, then we simply have no right to make such statements. It is unscientific. The same applies to the biologist Richard Dawkins, with his belief that strict Darwinism can explain everything, and that life is an accidental product of matter. I feel that he is trying to answer the ultimate question by pretending it does not exist. ‘Growth of God’ signifies the existence of God, or at least the existence of something you might call divine, however, unlike ancient conceptions of God. Everyone - pantheist, atheist, skeptic, polytheist - has to answer these questions: 'Where did I come from? What is life's meaning? How do I define right from wrong and what happens to me when I die?' Those are the fulcrum points of our existence.